There aren’t very many games out there that can make a grown main soil himself. The original Dead Space is one of the leading contenders. I’ll openly admit that I jumped like a little girl many times through my first play through, and loved every minute of it. 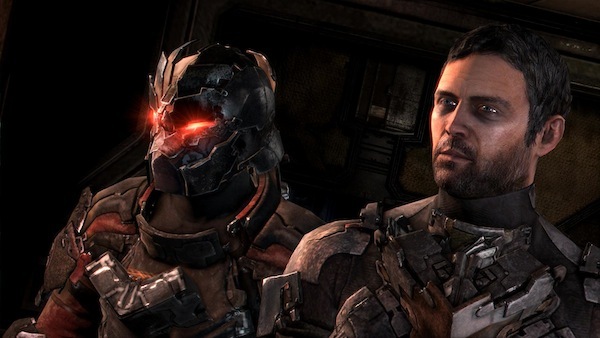 EA started off their press conference with a teaser trailer for the next installment in the series, Dead Space 3. The trailer didn’t show us a whole lot about what to expect, but the gameplay footage might have shown us our greatest fear, co-op. Isaac is back and has a buddy with him, John Carver. They crash land on the frozen planet of Tau Volantis, and find a little more than the abominable snowman. What’s wrong with that, other than everything? I had heard rumors that Dead Space 3 might contain a co-op mode, and while I love co-op, the entire atmosphere of that series is generated from you being alone in a dark corridor with a bunch of freaky necromorph babies. The action and the visuals are what I expect from a Dead Space game, but it just appears to be a completely different experience. I guess I’ll take back the box of Depends I bought for this title, because life just isn’t as scary when you’re making snow angels with another dude. Despite all of my complaints, the game still looks good from an action standpoint. Even though I’m likely to remain completely in control of my bowels, it still deserves a fair chance, and remember to dismember. Dead Space 3 is set to launch in Feb. of 2013 for Xbox 360, PS3, and PC, which will give us all enough time to cool down and hopefully enjoy the game as a slightly different experience than we’re used to.